Thousands of teams have made Shop4teams their #1 choice for the custom softball uniforms needed to look and feel like champions. Whether you are on a fast pitch or slow pitch team, Shop4teams softball uniforms that are just your speed! We offer customizable in-stock softball apparel for every age group and every type of league. From uniform options for local youth leagues, corporate softball teams and everyone in between, we make finding the perfect softball jersey easy for you. Our online catalog has a variety of affordable and stylish custom softball jerseys to choose from. Some players love racerback or sleeveless jerseys and shorts and others would rather have full button down jerseys and pants. We offer every style of custom softball uniform your team might demand including a full lineup of choices for men’s, ladies and youth players. Choose from tees, raglans, hats, caps and more and design novelty gear that will be the envy of your competition! We are a recognized leader in custom softball clothing and softball uniforms because our products come only from the best brands in the industry. When you order custom girls softball uniforms from Shop4teams, you’re ordering products from Augusta, Holloway, High Five and Teamworks. It simply does not make a different which custom softball products you need, order from us and you’ll receive products that look, feel and perform like a champ! Our team can even take your ideas for custom logos and designs and integrate them into innovative custom softball jerseys, without throwing you curveballs. Parents and coaches like to show their support by wearing their team's colors as well. Our huge selection of coaches apparel and fan jerseys allow everyone to show their team pride. Custom team sweatshirts and jackets will keep you warm from early spring practices through those cold fall games. Please take a few moments to browse through our extensive collection of custom softball clothing and apparel. 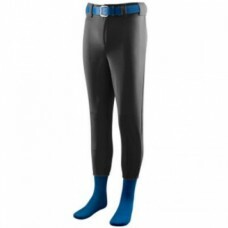 Whether you need custom youth softball pants and shorts for a youth league or fast pitch softball uniforms for a men’s or women’s league, Shop4teams is here to fill your order fast and efficiently. Whatever your colors, logo, or budget, we can create a softball uniform package that meets your needs. Do you have questions about our prices, uniform availability, or process? Don't hesitate to contact us today. You can have brand new custom softball uniforms in as little as two weeks. Size chart 100% polyester double knit * Relaxed fit-full cut with longer inseam and open bottom * El.. Size chart Two layers of 100% polyester tricot mesh * Fully reversible for wearing on either side * .. Size chart 14 ounce 100% polyester double knit * Relaxed fit - full cut with longer inseam and open .. Size chart Outer shell of 100% micro polyester * Body lined with 100% polyester mesh * Sleeves lined.. Size chart Two layers of 100% polyester Chill Fleece * Pill-free* Ultra-soft * Close fitting* Stretc.. Size chart 100% polyester double knit. Elastic waistband with inside drawcord. Right back patch pock.. Size chart 100% polyester double knit. Elastic waistband with tunnel belt loops. Two-snap closure. Z..
LIMITED QUANTITIES ! Please call for availability !Size chart 14 ounce 100% polyester double k..